Welcome to Wandell's Office Furniture Inc! All your used and new office furniture needs. Wandell's Office Furniture offer quality new, used, and refurbished office furniture. We are a business located in Bloomsburg, PA, serving the region, including Wilkes-Barre, Athens, Towanda, Harrisburg, State College, Bethlehem, Stroudsburg & Williamsport. Come visit us and see our showroom. We can help you with your office needs. 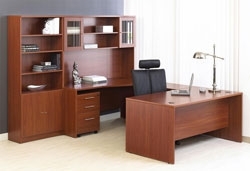 We offer a large selection of office desks, chairs, bookcases, computer furniture, credenzas, file cabinets, conference tables, office panels,and panel systems. If it is not shown on our showroom floor it can be ordered. Most orders can be received within 7 business days.